I hate to start this blog entry with excuses, but all the indicators leading up to this day were telling me that this day was going to be a rough one. In fact, I had serious doubts that I would be able to finish the distance this time. Since the Nootka Trail Run 2 weeks ago, my body has had deep fatigue, and my running has been extremely sluggish. The last two run group workouts, I have pulled out, simply because my legs couldn't hang on. This is not like me at all. Dropping out usually for me is never an option. Coupled with this fatigue was the fact that my family went on a family trip to Vancouver 2 days before the run. While that may sound all fluffy and nice, it was totally draining. The first day there, we spent just over 3 hours at PlayLand. 3 kids (5,3,1) for 3 hours at PlayLand. The second day, was spent at ScienceWorld, and was pretty much the same crazy agenda. Also Cooper has been teething, so the sleeps have been very poor. 3,4,5 hours of sleep became the norm. Vancouver would prove to be no different to this pattern. On the ferry ride back to the Island, I met Annie, Simon and Bob, who were doing the run the next day. I spent most of the ferry ride filling them in on the details of the run. Meeting new people - and almost always, there are awesome people - is always one of the highlights of running. About the only thing I had done well, I felt, was my nutrition. I thought that if my body could just get rested up, I would have the fuel to carry me through the trail. That night though, I went to bed anxious as hell for a run that should have been filled with excitement. Early Saturday morning, I grabbed all my gear and went to pick up Carlos. He and I then zipped out to the Thetis rendezvous spot, where we then waited and met most of the runners that day. The idea was that we would then carpool from this location, but as it turned out, most people had already figured out their respective rides and all the cars were already full. So, we all just bombed out to China Beach, which would be the starting point of our run. I was amazed that we had 21 runners there that morning. I was excited to see my partner-in-crime, Bob Wall and his family in the parking lot. Also there was last year's course record-maker, Shawn Nelson. After figuring out the transport logistics and gearing up, we all set off at 7:33 am that morning. I actually felt good that morning, and my legs seemed alright. I decided on the car ride out that I would attempt to go at my usual fast pace, and just see how things went, knowing that there was a strong possibility that at 30k I would bonk. As it turns out, I led the pace for the first little bit. I was feeling great, and my feet longed to be hitting such a wicked trail. The mud didn't seem to bad, and the trail was in excellent condition. Even though it was a little wet, the dry summer had made the trail drier than I had ever seen the trail before. Some of the new runners in our group remarked at how wet the trail was, but it actually was dry, relative to previous years. After all, this was the JdF Trail...it is permanently wet in most places. Shawn Nelson joined me for the first bit with the early pace. He was keen this year to not only break the course record, but he also was saying he though he was capable of 5:30 this year. He, no doubt, was in the best shape of his life, but a goal time of 5:30 was a tall order for anyone. However, time would only tell if this could be done. As we hit the Mystic Beach at Km 2, I had my head up along the beach section trying to eye the trailhead again. It was here that in two previous runs I would get momentarily lost. But not this year. I could see the sign (which was located right behind a rock), leading us back onto the trail. So Shawn and I blasted up the hill back into the rainforest. By now, another runner was keen to join our tandem. Shane Ruljancich, perhaps the Island's best climber, was now with us at the front. I had spent some time running with him during our Hurricane Ridge Run, and I was not surprised to see him up with the keeners. However, he was, by no means, a long distance guy, and I was interested to see just how long he could last on a 47k run. So the run continued for the next few kilometres in the forest. Salal, sometimes higher than my head, surrounded the trail in places. Cedar and fir trees composed the rest of the forest. It really is spectacular, the beauty that our world has. On a couple of occasions, both Shawn and Shane commented on how fast the pace was. I didn't really notice. Around Kilometer 5, I stopped to take a pee and Shawn and Shane passed me. It was then that I noticed yet another runner who was just behind. Sean Chester caught up to me and we ran together for a little bit. I didn't know Sean, but his reputation preceded this first meeting. He was a track champ, specializing in the 3000m, 5000m and the 10,000m distances. He had run for UVIC just recently, and done very well from what I had heard. Like Shane, he is an incredibly talented runner, but would this long run just be too much for him? I knew that he had completed a 50k race on a flat surface a couple years back, so I suppose he could pull it off. Again, time would only tell. At Kilometre 9, the trail once again gave way to another beach section, appropriately named Bear Beach. The rocks on Bear Beach made it next to impossible to run, but we attempted to keep moving, even though our running stride was less than picture perfect. The front two guys were still not too far ahead. I could see them about 45 seconds infront, and Sean Chester raced ahead to join them. That left me on my own, and I could see nobody behind me in my rear-view mirror. As we hit the trail again at the end of Bear Beach, I was now on my own. The trail now in this section gets very hilly, and power hiking up the slopes is the norm. The quads sure taking a beating pressing up the hills, only to hammer back on them on the sharp downhills. The Juan de Fuca Trail is best summed up by the description of going up a steep hill, getting to the top, then going down a steep hill on the other side, then crossing a river, and then repeating that pattern 50 times. That is the trail, and that is what this section was certainly all about. I was mentally fine with being on my own for this run. You kinda always hope to run with someone (especially when there were 21 of us! ), but I knew the trail well enough and I really was at peace out there. I was surprised then at around Kilometre 12, to see Sean Chester waiting for me around a corner. He had just taken a pee, and he had decided to let the other two top dogs go. His tactic was smart, as getting out too fast on such a long trail would only come to haunt him in the end. Him waiting for me was a sign that he wanted someone to run with this day, and that someone was me. It was now at this point that I got a really good chance to look at this guy. He looked a bit out of sorts, really. He was wearing racing flats, split shorts, a lumberjack shirt and carrying a 1.5L plastic pop bottle that he dropped regularly. He complained that his long hair was in his face, and at times, made it hard too see. However, as odd as this pairing was, he and I were committed for the long haul together. It is always nice to get to know new people on these runs. Over the course of the trail, I would say I got to know him. Besides, let's face it, there isn't really a whole lot to do with someone for hours on end, except get to know them. Sean and I made steady progress over this hilly section. It certainly was wet at times, and by this point, my ankles were caked in mud. Things though, were going well for me. I felt good and was keen to show this new guy around my neighborhood. I think this was also one of the reasons Sean wanted to run with me. I know the JdF Trail very well, having run it 4 times before, and he wanted to make sure no wrong turn were taken along the way. At Kilometre 21, we finally made it to the next section of beach. Sean and I stopped briefly to grab a gel and we were both relieved to get that monotonous section of trail over. It's wasn't easy, but we were now close to the half way point of our run. I think we were about 2 hours into the run now. Now, I knew, would be the real test for my body. Was my body recovered fully from the Nootka Trail, completed only 2 weeks ago? Could I keep this pace? Chin Beach is not a whole lot different than Bear Beach. Not much of it is run-worth, but Sean and I did our best to make haste on the rocks and gravel beaches. By now there was no sight of the leaders infront of us, and no doubt, they were likely a good 10-15 minutes now ahead. However, I really didn't care. In fact, I thought to myself, if there are any bears on the trail, those two fastees will scare them off the trail! At the end of Chin Beach, I saw the trailhead marker on an outstretched rock. I pointed this out to Sean, and then told him I knew of a short cut. He was game, and I then told him the story of my last outing on the trail. Last year at this very point (I was running with Shawn Nelson), we missed the trail marker and continued on the beach by accident. As it turns out, we sneaked out nicely ahead by about 100m, and as a result, avoided one (maybe two?) of the headland climbs. I assumed that Shawn (and Shane) likely did the same thing this year as well, and I noticed two sets of footprints going the same direction on the beach along the shortcut. Well, the shortcut worked perfectly. It can only be done at low tide, but it took us under a sea arch and around a point to a small trickling river. We then climbed onto the edge of this river where we rejoined the JdF Trail. The shortcut worked perfectly, and we were back on track. More hills, more mud, more roots. The JdF truly is a battle and we were now about to have our mental game tested to the nth degree. At Kilometer 25, I could see the Loss Creek Bridge ahead, and I told Sean to prepare himself for something quite remarkable. On the bridge, it was an awesome feeling. This suspension bridge is a huge one, and passes 100-150 feet above the canyon. Waterfalls can be seen, and it was awesome to see Sean get excited about this. Probably this bridge and the sea arch we saw earlier are the two highlights of the trail for me. Truly awesome. The only bad news about the suspension bridge is what follows it. And what follows it is the biggest climb on the trail. The next section went up, then up, then even further up. We made it however, and took a small break at the top to gel up and rehydrate. My body now was beginning to diminish a little. My legs were a little heavy and my calves were a little tight. I actually got a small cramp in my left abductor muscle (one of those damn stabilizers) just after Chin Beach, but it had since gone away. So, I stuck to my game plan of taking one gel and S-Cap every hour and grabbing a drink of water whenever I could ontop of that. Sean was out of water, but I alerted him to the fact that a refilling station, in the form of the Sombrio Waterfall was only about 2 kilometres away. So we made short work of the next section - which is the only flat, fast section - and we could now see Sombrio Beach and the Sombrio Waterfall way in the distance. But as nice as the flat section was, it certainly didn't last for very long, and now we were scrambling around a rocky coastal trail which had sections of mud and roots that grinded the pace right down to nothing. Slippery, muddy stairs also paved the way around Sombrio Point, and finally we made it to the waterfall. Here, we made a full-fledged stop and I refilled my Nathan Hydropack. More gels, more S-Caps. Sean filled his pop bottle and was chatting to a couple that was sitting upstream. The young couple was taking to Sean with great interest, and the young guy, was claiming that he wanted to run the distance of the trail. He was asking Sean about his marathon time and this guy was telling us just how good and tough he was. In hindsight, this guy was likely just talking trying to impress his girlfriend about how much of a man he was. I urged Sean to get moving again, and we were on our way, heading toward Sombrio Beach. We eventually made it and we happy once again to be on a beach section, even though running it was nothing short of impossible. As we got onto the beach, I saw a shelter that had a stereo, speakers and an amp. It appeared that some party, or band had been there. As we staggered along the beach, I saw a familiar face wave at me from the side. It was Steve Murenbeeld (aka Merm). He asked us how things were going and offered us a free beer. I could see a sparkle in Sean's eye, and perhaps a hint of drool. He then looked at me and with hesitation, reluctantly declined. This was for the best. There was no cause for celebration, as we only just were passed the half way point. 2 hours and 40 minutes. The leaders were 10 minutes infront. As we ran again, we found a small, flat rock path that was etched into Sombrio Beach. This was the only mechanism for moving along what was simply crappy terrain. I was then surprised to see yet another familiar face calling out to us from ahead. It was my running coach, Bob Reid. He was telling us to get inland where there was apparently a nice trail. Well, a nice flat trail sounded a hell of a lot better than the beach, so we gambled and went off the beach. In my previous runs, I had never gone this way before. But, it was hugely successful, and we found a flat piece of awesome trail that took us 600m to the top end of Sombrio. At the top end, we were forced once again onto the beach, but the bypass trail had likely made us some time for Sean and I. We were now moving along slippery rocks, just trying to keep from falling. Running wasn't happening along this stretch and we just simply tried to keep moving and gaining some ground. It seemed to take a long time before we finally found the trailhead once again. We were very pleased to get off the beach, and this would be the end of the beach running for us this day. With a quick motivation and mental check, we hit the muddy trail once again at Kilometre 30. This next section of the trail, for me, is the toughest. Not a whole lot is runnable, and it just seems to beat you up. My body was beginning to resist a little and I could feel things diminishing somewhat. I had bombed out before twice on this section of the trail, and I was going to do everything in my power to not let this happen again. On the other hand, Sean was now leading and seemed to be as strong as ever. His lead pulled me through the difficult times on this stretch and we eventually made it up to Payzant at Kilometre 37. I can't tell you why this last section is so tough. It seems to come at a time when your body is pretty much obliterated. And as tough as it always seems to be, the one thing I knew this time, is that I had never done it so well. So now with only 10k to go, we were now on the home stretch. I could just tell that Sean was feeling strong and he had been checking over his shoulder to see if I was with him for the past couple of k's. I told Sean that it was time. It was time for him to leave me and finish strong. I was lagging and he had a finishing kick inside of him. We checked our watches and we knew that it was possible for him to finish under 6 hours if he went hard. I lumbered ahead and then eventually at Kilometre 38, Sean zipped by and was out of sight in no time. The final stretch for me was a test of how well I could hang on. The trail in this section now becomes flatter, but the boardwalks that were along the trail (and there are many in this section) were as slippery as ice. I had to be careful not to fall down. My body was cramping in many different muscles now, but it wasn't too bad. I had experienced far worse. I was hanging on nicely now, and even though my stride was short and my range of motion was a bare minimum, I was covering ground. With only 3k to go, I checked my watch. Running time was 5:39. I quickly did the math: I had 3k to go and 21 minutes to do it. 7 minutes per kilometre seemed easy enough, so I decided to go for it. A sub 6 time for me would be ridiculous. The next kilometre went fast, but not fast enough. I covered it in 9 minutes, so now I had to do the last 2k in 12 minutes. But, I knew the last 2k were pretty easy. I still had a chance. Kilometre 46 went by in 6 minutes. I had done well, and I thought I could do it. I was now on the finishing road up to the parking lot and I had 6 minutes to get to the top. But, I couldn't quite do it. The ground was easy enough to run upon, but the uphill at this point was not easily run. I tried desperately to run up it, but met alot of resistance. I made it to the finish at 6:01. It was a heck of a day for me. 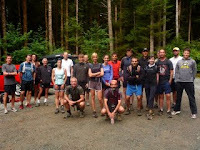 I had come off a 2 week taper after Nootka and nailed my best run on the JdF Trail. A 24 minute improvement from that of last year. And, I didn't feel horrible at the end. I was extremely proud of myself. In any other year, this would be a major course record. However, as good as my day was, some people out there also had epic runs. Shawn Nelson ran strong throughout and finished in 5:28. Shane Ruljancich ran strong for most of it, but bombed out in the last 10k to finish at 5:51. Sean Chester hammered his last 10k after leaving me and finished in 5:43. In the end, all 21 runners survived and had a great time out there on the trail. Some went fast, and some just tried to survive the distance. So, now I leave the JdF behind me. Mission accomplished. Next race is 4 weeks away, where I will do the 56k Great Lake Walk.